The Trump administration argues California hasn't provided required matching dollars and can't complete work by a 2022 deadline. 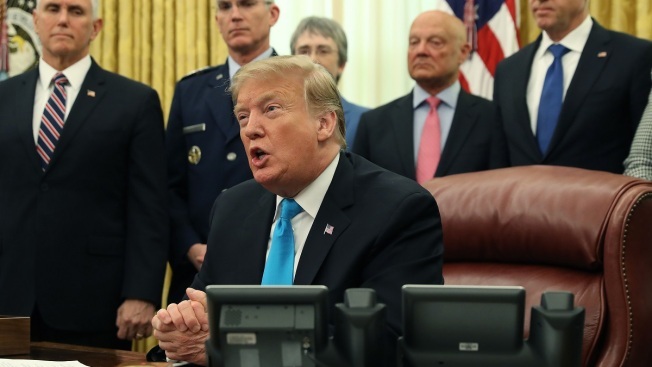 President Donald Trump speaks to the media before signing the Space Policy Directive during a ceremony in the Oval Office on Feb. 19, 2019, in Washington, D.C. The project has faced cost overruns and years of delays. The Trump administration argues that California hasn't provided required matching dollars and can't complete work by a 2022 deadline. Trump and Gov. Gavin Newsom have sparred over the project on Twitter in recent days, with Trump labeling it the "failed Fast Train project" earlier Tuesday. Newsom, a Democrat, and the state transportation agency didn't immediately respond to a request for comment. "This is CA's money, allocated by Congress for this project. We're not giving it back," he tweeted last week in response to Trump's threats. Congress nearly a decade ago approved the $929 million that Trump wants to cancel. The state has not started spending that money. But it has already spent the extra $2.5 billion that Trump now wants back. It's unclear if the federal government can demand that money back before the 2022 deadline.